'Talk to the hand, ’cause the face ain’t listening,' the saying goes.When did the world stop wanting to hear? When did society become so thoughtless? It’s a topic that has been simmering for years, and Lynne Truss says it’s now reached the boiling point. Taking on the boorish behavior that for some has become a point of pride, Talk to the Hand is a rallying cry for courtesy. Like Eats, Shoots & Leaves, Talk to the Hand is not a stuffy guidebook, and is sure to inspire spirited conversation. Lynne Truss is special: Her ability to weave an engrossing, if sometimes infuriating story around the misuse of punctuation in "Eats, Shoots and Leaves" had me convinced that her take on the death of manners would be equally endearing and enlightening. Unfortunately, it was not to be. I've no doubt that a lesser author could not have dealt with the topic as well as she did, but it seems that this book trades on Truss's popularity from "Eats", but is nowhere near as close to her heart. I didn't get bast the first 30 minutes and I have a long commute and will listen to just about anything! The strong British accent ( understandably, with a British writer) with less than intereting content made me not want to listen to the 2 CD's. All too true, unfortunately. Casual read, don't expect any epiphany's. I enjoyed this book, if only because she is a great writer and can dish out a hilarious phrase. But she did come through as a cranky old geezer, a bit out of touch with the world, and insisting that superficial manners will save us all. Not sure I agree with that premise. However, I did relate to many of the things she was bemoaning, particularly the amazing lack of courtesy or competence in many young people who hold service positions today. Okay, I'm now officially mad about Lynne Truss. 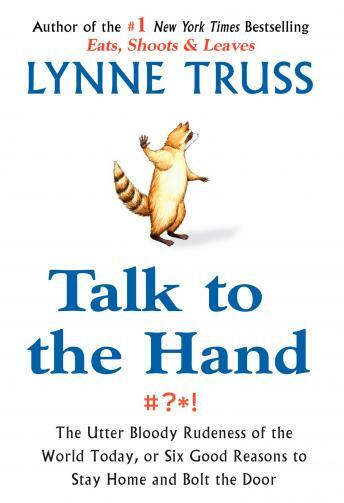 I was an instant fan when I read "Eats, Shoots & Leaves," so I was eager to hear "Talk to the Hand." Not only is it even more delightfully written than "Eats, Shoots & Leaves," hearing her read it makes it purely wonderful! Ms. Truss has the PERFECT VOICE for reading her own writing! It is, in fact, the voice I imagined for her as I read her earlier work! Also, of course, she pinpoints the examples of rudeness that irritate and infuriate me the most, so I feel vindicated and righteous when I hear her discuss those particular peeves. I listened to it twice, and hated to send it back. Now I'm going to listen to her reading "Eats, Shoots & Leaves," even though I've already read it, just for the pure joy of hearing it in her inimitable voice. There aren't enough stars in your rating system for me to assign to this CD. Really. The author's tendency to occasionally rant aside, I found this book to be entertaining and thought-provoking. There was interesting social commentary and some novel theories as to the reasons WHY people are so seemingly unaware that others even exist, let alone could be offended by private behaviou in public places. My 20-something assistant, for example, had no idea that subjecting others to her cell phone conversations might be considered rude. I bought 2 copies of this book to share with friends. Not as well read or written as I expected. Rudeness could be funnier.